Tire pressure monitoring systems are devices that are meant to save owners of many different vehicles time and money. For those that have yet to own one of these, a tire pressure monitoring system electronically records the air pressure inside pneumonic tires. These devices are great for tires from a car, bike, motorcycle, truck, RV or any other vehicle with pneumatic air tires. What is great about tire pressure monitoring systems are that you can use them as you are driving and read the tire pressure right from the dashboard of your car, so that you can be notified as soon as one or more of your tires experience low tire pressure. In this review, we will look at five great tire pressure monitoring systems that are compatible with or exclusive to trailers and recreational vehicles. These companies include EEZTire, Bellacorp and TireMinder. They all come with nice features as well as one or two problems that we will search for so that you don’t have to. Which is the best TPMS for RVs? Read our review to find out. Can monitor many tires at once. Allows you to install in two different ways. Is fairly easy to use. ​Can record pressure and temperature for up to 26 tires. This first TPMS is made by EEZTire, first introduced in 2012. This device as a large screen with a metallic finished frame. This TPMS is designed exclusively for RVs. Along with the monitor itself, you get the following: four sensors; one USB cord w/connector; one hardwire kit; one mounting support; one mounting bracket;, one numbering sheet; one bag of spare O rings; two sensor installation wrenches. Along with the purchase of this TPMS, you get a solid three-year warranty, if the device doesn’t seem to function right, and you can prove that the manufacturer is at fault, you can be eligible for a free replacement. This device is powered by a set of lithium ion batteries, which means you can recharge the batteries once it runs out of energy. The EEZ TPMS also includes a backlight for the screen so that you can read it in the dark. This TPMS can read up to 26 tires at once, so it can work with a vehicle with that many. To do so, however, you will need to purchase more sensors, as this pack only gives you four to start out with. This TPMS comes with a nice, large screen, with great contrast. The screen can easily be read from an arm’s length away. The TPMS can also handle up to 210 PSI of tire pressure, making it a resilient system that can withstand the most aggressive of situations. You also see and hear alarms and cues for the evens in which something were to happen, such as insufficient air in one of your tires. It’s great to know of any problems as soon as they occur. Despite the good that this kit offers, the reception quality is not that great. Your sensor needs to be the closest possible from the monitor in order to get the results that you desire. ​Can monitor many tires at once. ​Comes with a three-year warranty. ​Reception not great from long distances. ​Can record pressure and temperature for up to 22 tires. Along with the monitor itself, you get the following: six sensors, a carrying bag, six O rings, a hard-wired signal booster, an allen wrench, a mounting bracket, six anti-theft locking rings and one USB car charger. This device is powered by a set of lithium ion batteries, which means you can recharge the batteries once it runs out of energy. This TPMS can handle PSI of up to 232, which is more than EEZTire’s. It can also detect air pressure and temperatures from up to 22 tires at a time, but there are six sensors that you start out with. The monitor resemble an iPhone in portrait mode. It has a lavender/purple tint to it, and displays a diagram of your RV and all of the tires it can read. This device comes with a basic one-year warranty. If something goes wrong with it within the first year, you can be eligible for a free replacement. The wireless reception is really outstanding. No matter how far apart the sensors are from the monitor, TireMinder did a great job programming the monitor to connect with minimal trouble. The carrying case is a nice touch, so that you can store everything and carrying it without finding a bag for it all. The one problem about this TPMS is the antenna. It is practically useless and we do not see how it helps or hurts the reception of the monitor. ​Comes with a one-year warranty. ​Antenna serves no real purpose. ​Can record pressure and temperature for up to 8 tires. ​This next TPMS is from Bellacorp. Not only can this system work with RVs, 18-wheelers and semi-trailers, but also with smaller vehicles like cars, trucks and more. Along with the monitor itself, you get the following: A mini USB power cord, suction mount, hardwire mount and six anti-theft sensors. Bellacorp’s TPMS resembles a GPS device, with a landscape monitor and five buttons of navigation. This device can track air pressure and temperature for up to a total of 34 tires at a time, which is crazy. You could use this TPMS to monitor tires on an 18-wheeler towing a 16-wheeler, which is almost unheard of. There are some strong sensors that can withstand water submersion from down to about three feet. If you for instance had to cross a shallow river or giant puddle in the road, these sensors will stay on and survive without question. It is also good to have options for how you want the monitor installed in your car. If you don’t want it hard-wired, you can opt to use the suction mount for easy assembly and disassembly. Like TireMinder’s TPMS, this one has very responsive and accurate readings for each of your tires. It works exactly like you expect it to. The TPMS can also handle up to 175 PSI of tire pressure, making it somewhat limited in terms of what this device can handle. ​Allows you to install in two different ways. ​Can record pressure and temperature for up to 12 tires. Yokaro’s TPMS comes in a nice, slim and flat design, rather than the taller, slumsier type that TPMS devices are better known for. This TPMS comes with the following: Six anti-theft sensors, six o rings, a USB car adapter, an allen wrench, a USB cable, six nuts, a repeater and a non-slip mat. Each of the six sensors that this TPMS comes with are dustproof, waterproof, and immune to possible thefts. They also will not fly off at random, such as when you ride over a bump. This is an affordable TPMS, so we find it to be a real steal on the market. We do find the price to be justified, though, as there is not much that it offers compares to more costly of TPMS products. The concept of a narrow screen is nice. While it’s not big, it still does its job to display important information as large as possible. This TPMS is fairly easy to use, making it enjoyable for RV owners of all kinds. The TPMS can only handle up to 87 PSI of tire pressure. That is not much, and we feel that this TPMS is not made with RVs in mind, but rather with cars and vans. If you are looking for a great TPMS for the car, this is a good product to buy, not not really for trailers or RVs. ​Is fairly easy to use. ​Can record pressure and temperature for up to 6 tires. ​This last TPMS comes from Tire-Safeguard. The monitor has three buttons on the side of navigation and also sports a stubby antenna. Along with the monitor itself, you get the following: Six anti-theft sensors, a suction bracket and a car adapter. This is a rather simple TPMS. It is capable of monitoring tires for temperature and air pressure in real time. The TPMS can also handle up to 200 PSI of tire pressure. It also can only receive data from just eight sensors at once, so if your vehicle or haul has ten or more tires, it is unfortunate that this system is not capable of more. You can adjust alerts, which is a trivial concept at first, but also has its benefits. For one, if you driving in hot weather, the TPMS will often alert you that the tire temperature is high, but you can set this limit to higher temperatures so that it only alerts you when there is a real problem. This TPMS has a suction mount only, but what is great about suction mounts is that they can be removed and place on another location on the dashboard when need be. This TPMS has excellent range, so it can clearly pick up all your sensors no matter how long your RV is. You will not need to but an extra extender range, which is a great feeling. The screen on this monitor is just too small. We need to lean closer to it in order to see the information, and it can really be distracting and take our mind off of the road. How does an RV tire pressure monitoring system work? There are two parts to a TPMS product: A monitor and its sensors. The sensors act as mini thermometers and tire pressure gauges for each tire you own. The sensors send this information while the device that serves as your monitor collects it. When each tire’s information is collected, it wil be displayed on a diagram on the screen for you to see. When a tire is recognized as having a lack of pressure, or is too hot or cold, the monitor will give you audio or visual cues or both so that it assures you that something is wrong and you need to take action. When you notice a lack of air in one tire, you can simply pull over on the side of the road and refill that tire with air to solve the problem. This will prevent a flat tire or blowout from occuring later on. Eeztire vs. Tireminder: Which one is the best? EEZTire and TireMinder are two TPMS companies that are known to have unique advantages over the other. EEZTire, for example, is a brand whose monitors are known for being large in general and come with anti-theft technology included in each sensor. It is designed in ways that help the user in the best ways possible. EEZTire’s systems are also known to be easy to set up and use. Then there is TireMinder, which is suitable for a wider variety of large vehicles beyond just RVs. They can be used for mobile homes, motorcoaches and fifth wheels. They also are known for being capable of monitoring more tires at a time. Owners can also enjoy more audio cues in case of problems, which are a staple to TireMinder’s TPMS products. How to test and replace TPMS sensor battery? Of course, TPMS sensors are not able to run indefinitely, and most are run on batteries. Therefore, it is important to check the battery from time to time to see whether or not it needs to be replaced. If the battery fails, then you can no longer rely on the TPMS device to work as expected, either giving you misleading data or insufficient or no data at all. Sensors are designed to send data to the monitor often in just a brief period of time. If for whatever reason it fails to send data over, it is best to assume that there is some sort of interference going on. Before trying anything else, see if anything out of the ordinary might be obstructing the path between the device and the sensor. If this problem happens more than one time, it should take note of this on its own and notify you of a possible malfunction. When this happens, your best bet is to replace the battery that is inside of the sensor. If changing the battery does not solve the problem, then you will have to replace the whole sensor. What does a tire pressure monitoring system monitor? A tire pressure monitoring system monitors two primary things about the tires on your car: The air pressure and the temperature of the air. A TPMS is not meant to improve performance of your car in any way, but rather to see the air pressure and temperature in each tire in real time without manually having to check each one. A TPMS can let you know if any tires lack in air pressure, or have too much air pressure, so that you can make a decision on that tire in question. TPMS systems are great for preventing a bigger problem later. What tire pressure sensor range do I need? There are many types of TPMS products for RVs and trailers. If you are considering a TPMS for your RV, it is important to know that RVs have tires with higher air pressure than regular cars, so you need a TPMS that more idealy made for larger vehicles like RVs or trucks. A TPMS for cars shoud at least be able to record air pressures of up to 100 PSI, but the products in this review do not have PSI limits that low. How many TPMS sensors do I need? The number of sensors you need simply depends on how many tires you want to monitor on your RV or other vehicle. To put it simply, you need one sensors for each tire that you want to monitor. Most TPMS products come with at least 4 sensors, as that is the minimum number of tires required for every street legal vehicle. If there are more than four tires on your vehicle, these manufacturers do sell more separately, so that you can get as many sensors as you need. It also may be necessary to buy spare sensors in the even that some of them break or get lost during use. For motorhomes, six sensors are recommended. For hauling a motorhome with another vehicle, you will need at least ten. The great thing about these sensors is that you won’t even need to be driving in the same vehicle as the RV to check on its tires. What is a range extender and do I need one for my TPMS? A renge extender is meant to simply amplify the distance of the reception that the TPMS gives off, so that signals from your sensors are able to be picked up from longer distances. This is very useful to trailers, RVs and trucks that are very long in size, or are being towed from very far away from the driving vehicle. Do you need a range extender for your TPMS? The answer is never that easy to find out. If you have an RV that is less than 25 feet, then you likely do not. If you have a trailer longer than 25 feet, then you probably do. It is also important to know that the TireMinder A1A also includes a range extender, so if you think you need this extra, it’s great to know that this model already comes with one. 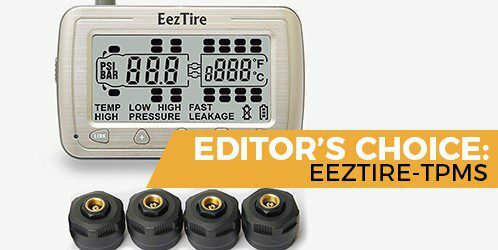 After careful deliberation, the best TPMS for RVs is none other than the EEZ RV EEZTire-TPMS Real Time/24x7 Tire Pressure Monitoring System. What sold us on this TPMS the most is the big screen. Some RV owners might not like the larger screen, for one reason or another, but having a large screen can give RV owners an advantage in being able to see what is going on with your tires without having to look closely at it. The other big advantage is the warranty. You will be happy to have a lengthy warranty that the other TPMS products do not have. Three years is plenty of time and if there are any defects, then you can be rest assured that you can get a new TPMS that hopefully works better. The reception is our only gripe with this EEZTire TPMS, but it really isn’t that serious of a problem, and it should still work in a serviceable manner.